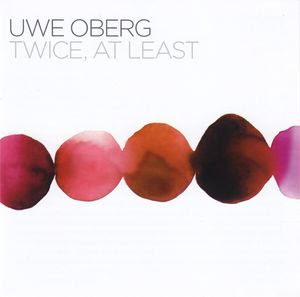 German pianist and composer Uwe Oberg is often found nestled in a duo, trio or quartet, so his solo album Twice, At Least gives an intriguing insight into his own musical motivations. Twice, At Least is comprised of live recordings in which original compositions are blended with treatments of Monk and others. He creates an open solo structure in which there is scope both to indulge in playful thoughts and to lay bare powerful emotions. These patient, searching free improvisations develop into a very rewarding listen. The opening piece, Chant II/Kelvin, dovetailing two Oberg originals, begins minimally: a neutral key lightly played before sliding into discord. We swing between light taps and a rolling bass absorbing all before it. He presents innocent themes with sinister undertones - imagine a gambolling fawn picking its way along the hard shoulder of the M4. These cinematic snippets appear cut between jaunty themes as over a dozen minutes Oberg sets out his stall: intense, unpredictable, yet coherent. The abrupt, high-energy arrival of Enzym & Eros brings bravado and old empire pomp. Repeating and alternating between defiant cries and grand flourishes, Oberg rumbles and rolls, deconstructing the composition plank by plank before he abandons the piece disappearing amongst a hyperactive tinkled flurry. The reimagining of the solo piano continues in Magnetic Wood, where the introduction of a Mbira (thumb piano) – an instrument as much a part of southern African sounds as it is becoming part of Dan Nicholls' north London electronic stylings – adds a more percussive approach. The understated high point is the Monk/Oberg combination Brilliant Corners/Twiyed Place arriving with a tinkling steely wash, echoing and reverberating gently behind the clean piano. Among the searching chords we settle into a fresh atmospheric piece, looping and re-referencing phrases with an unexpected Kieran Hebden lilt. The delicate drawn out chords at the opening of Pannonica and the care which follows encapsulates a style which delights in leaving a respectful space amongst the notes when needed – a contained, sparse melancholia. Interspersed amongst Oberg originals and Monk adaptations (which Oberg evidently feels equally at home with) are changes in compositional tone. Touching provides the time and separation for some beautiful phrasing and clear tones, while the chunky King Korn - high speed and tumbling over itself much like Mingus at the bench - remains an exciting counterpoint. Oberg possesses a unique approach: at times frugal, at others erratic or classical. Here is a man as comfortable with one hand on the keys and the other in the belly of his grand piano beast as he is delicately playing by the rules with both hands on deck. The liner notes by Claus Gnichwitz of Hessischer Rundfunk refer to his “density and intensity”, a texture drawn out through the continual establishment of themes. Each theme is rolled out, laid aside and lost, only to be unearthed again with a fresh, exciting perspective. To build and develop as Oberg does, everything must happen twice, at least. "